Detailed Description: Red Dot Type LR Conduit body features copper-free die-cast aluminum construction to offer enhanced durability. It has smooth throats to offer easy and convenient wire pulling. Conduit body with covers and gaskets has internal threads to offer tight/rigid joints. It has an ample spaced, accessible wiring chamber to offer a convenient location to pull conductors. Conduit body comes with retained stainless steel cover screws to offer easy and convenient installation. The 1-1/2-Inch hub is ideally designed for terminating electrical conduit through the walls of enclosures. It measures 7-1/4 Inch x 3-3/8 Inch. Conduit body is UL listed and RoHS compliant. 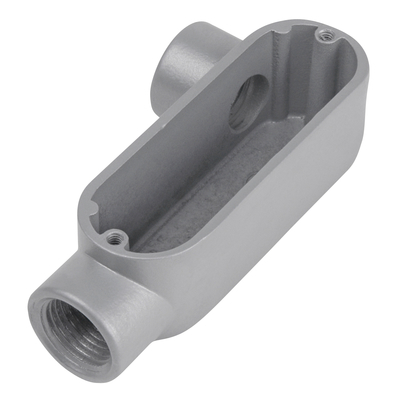 Catalog Description 1-1/2 inch Threaded Die Cast Aluminum Conduit Body with Right Side Opening. For Use with Rigid/IMC Conduit.